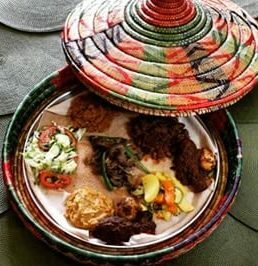 10 Essential Dishes And Drinks – Fresh Injera delivery to your door! If you live in a sizable city, chances are you’ve tried Ethiopian food. Even the long-running cartoon sitcom The Simpsons includes an episode where Marge and the kids learn to “rip and dip” into the rich stews you’ll find on an Ethiopian table. The cuisine is one of the world’s healthiest and most flavorful, not to mention most photogenic. Ethiopians are rightly proud of their culture and take pains to preserve traditional foodways. “Injera is not a dish itself, but the vehicle for almost every single meal in Ethiopia,” says Richman. She’s not kidding: When I was in Addis (as everyone calls it) last year, even a breakfast of stir-fried injera, known as fir-fir, was served with even more injera on the side. Injera is also a superfood. The flatbread’s main ingredient is teff, “an ancient grain that was first cultivated in Ethiopia,” explains Addis Eats cofounder Xavier Curtis. 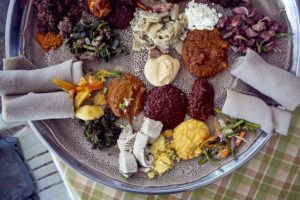 “It’s incredibly high in protein, calcium, and iron and also naturally gluten-free.” If you’ve ever eaten injera Stateside and found it to be heavy, it’s probably made with cheaper rice flour, which “gives a similar consistency, but it’s heavy,” he says. 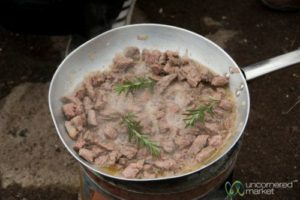 The country’s “go-to meat dish,” as Curtis describes it, is usually made from beef cut into small chunks and sautéed in butter or oil with onions, garlic, hot pepper and rosemary. You’ll find this on most general Ethiopian menus, served with injera, naturally. 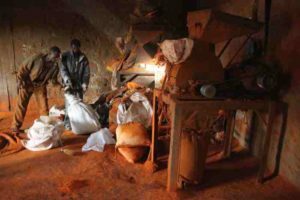 Ethiopians are super-proud of their coffee, which they grow domestically. Richman explains, “Ethiopia is the birthplace of coffee and grows hundreds of varieties, and there are still thousands of undiscovered varieties! 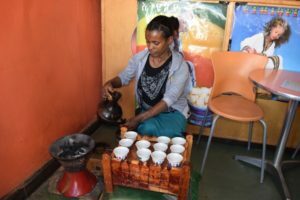 The majority of coffee in Ethiopia is still wild-grown and harvested on a very small scale.” You can find very good espresso all over Addis Ababa (a legacy of Mussolini’s short-lived, unsuccessful attempt to colonize the country), but the more traditional way to enjoy the beverage is with a coffee ceremony. After a meal at someone’s house, or even at a restaurant, you may be presented with a small cup of strong espresso that’s been brewed over a charcoal brazier in a clay urn. “Incense is burned after a coffee ceremony, but not pure frankincense, because that’s only for the church,” says Richman. Here in the West, we usually refer to tej as “honey wine.” Well, that’s wrong. “Calling it a wine is a misnomer, as it’s more similar to a boozy, sweet after-dinner drink,” Richman explains, and made from “smoky, earthy unprocessed honey.” Though I failed to get into the drink’s sweet, potent taste, Ethiopians love it so much that tej is considered the national drink. Maybe I just didn’t try the right one. 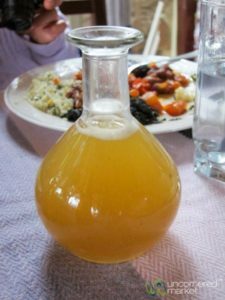 Curtis tells me that “the best tej in the country is found in the areas where the highest-quality honey is produced (usually in the north).” Tej is typically served in glasses resembling a laboratory beaker. Its yellow color comes in part from the addition of powdered gesho, a species of buckthorn that lends a hoppy quality. Ever had avocado juice? If you hit up a juice house in Ethiopia, it’s likely you’ll try it. Long before the yoga crowd got into juicing, Ethiopians have been drinking fresh fruit juices on the regular, “usually as a snack, maybe between breakfast and lunch,” Richman explains. On the Addis Eats tour, I sampled the tasty tri-colored concoction above made with papaya, pineapple and avocado juices. Since juices are sometimes thinned out with water, make sure the place boils theirs. The most typical Ethiopian breakfast is fir-fir, shredded leftover injera that’s stir-fried with berbere and kibbe. The spicy, carb-y morning meal might be mixed with leftover shiro or meat stews. And yes, even though the main ingredient in fir-fir is injera, it’ll probably be served with more injera on the side. 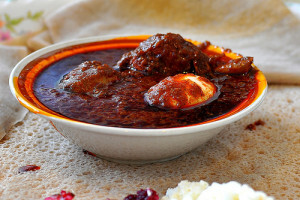 On my Addis Eats walking tour, we sampled doro wat, a rich red-colored chicken stew Richman describes as “iconic.” We were lucky to eat it in a restaurant, since the dish is usually “hard to find, because it’s generally made in people’s homes,” she explains. Good doro wat should be prepared with Ethiopian chickens raised free-range on small farms, rather than the larger “farangi” (foreigner) chickens you can also find in the country. The stew gets its deep red hue from berbere, and the richness is often offset with an accompaniment of fresh cheese and gomen (stewed greens).